The season for field trips is mid-April through October 31. School groups must be booked in advance through the Education Department and receive a special admission rate. To ensure a quality experience for all guests, there is a limit of one large school group per day or two small groups; therefore, we recommend making your reservations early. 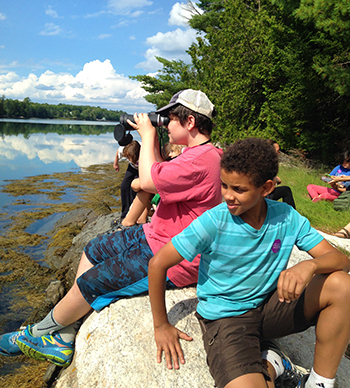 Contact our education department at fieldtrips@mainegardens.org or (207) 633-8031 to schedule your field trip. To help plan your visit, feel free to download the CMBG map. We also offer a fun Gardens Photo Scavenger Hunt that encourages creative interpretation and discovery. Designed for teachers who want to make their visit part of an overall curricular unit, these units are aligned with the Next Generation Science Standards. Our intensive units include a classroom lesson and a field study, last approximately 2 hours and include free downloadable pre- and post-visit activities help to prepare for the visit and reinforce concepts back in the classroom. Price: $50 per class (not to exceed 25 students per class; does not include Gardens admission). Students will be connected with life sciences in the garden through hands-on field study explorations and activities that highlight living organisms and their life cycles. Our one-hour field study programs can be adapted to grades PreK-6 and are aligned with the Next Generation Science Standards (NGSS). Price: $25 per class including take-home project (not to exceed 25 students per class; does not include Gardens admission). Central Gardens Walk – (PreK-6) Introduces our Garden of the Five Senses and Children’s Garden. 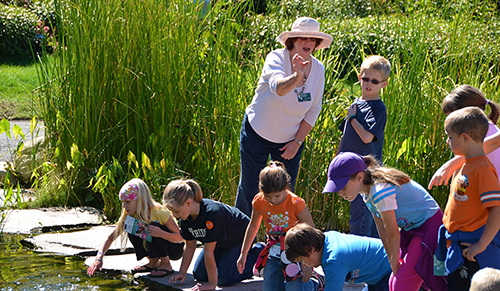 Five Senses in the Garden – (PreK-6) Students will put all five senses to use as we explore the Lerner Garden of the Five Senses. If you prefer, check out a Discovery Backpack for your students during your field trip visit! Our Discovery Backpacks add more structure to your visit while giving your students the opportunity to use the Gardens as a place for investigation and discovery. Choose from our themed backpacks, including Birds at the Gardens, Flowers and Pollinators, and Trees of the Maine Woods. Each backpack, which is ideal for two students to share, contains field guides, scavenger hunts, games, binoculars, a field journal, and materials to perform more in-depth studies. Ten backpacks may be checked out at any given time for a fee of $2/backpack. We are always looking for ways to integrate the Gardens into Maine curriculum. Please contact our Education Department if you have suggestions, comments, or ideas.